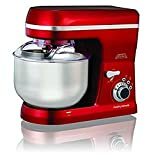 Stand mixers are the ideal choice for those who want to prepare delicious baked dishes through a hassle-free preparation time. Nowadays, these are one of the common appliances making their places in many kitchens. Large capacity 3L stainless steel bowl with stainless steel dough hooks and beaters. 5 speed settings with eject button and detachable hand mixer. Has a wonderful ability to bear heavy duty work. 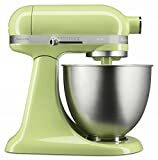 From mixing ingredients for tasty pie to making bread dough, it can do all. Just a push of the button and your dough is ready. 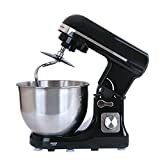 In some of the best stand mixers, you would find features like locking tilt head, overload protection, speed adjustability between 10 to 12 approx., timer, standard 3 attachments, motor, etc. There are also models that have hubs for connecting with other accessories. However, these features vary with brands. 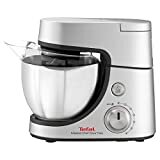 The preferred brands offering quality products include Panasonic, Philips, Hamilton Beach, Platini, Sunbeam, Kitchen Aid, and others. Get the best one for you.